Injuries of the skin resulting from contact with electrical energy, extreme heat, heated objects, or certain chemicals often exhibit characteristic patterns. For example, immersion of a child's buttock in 140°F (60°C) water will result in second-degree burns to the immersed skin. The resulting burn pattern will show a characteristic line of demarcation that represents the amount of skin immersed in the hot water (Fig 257-11). Similarly, contact of the skin with electrical current can result in a central area of necrosis characteristically seen as black, charred tissue surrounded by a pale zone with a bright red peripheral margin. Tremendous electrical force contained in a lightning strike may produce relatively little in the way of external evidence and may include only singeing of hair or slight charring of skin where contact occurs. An arborization or fernlike pattern of redness may be seen on the skin of fatally injured victims. A possible result of contact with a lightning strike is magnetization of certain metal articles on the victim's body. The entrance wound of a skin penetration caused by a high-speed missile (such as a bullet) or a low-speed missile (such as an arrow) is circular, oval, or triangular, with a circumferential rim of abrasion. 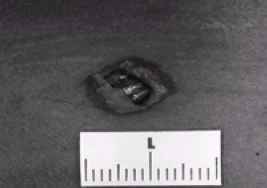 This abrasion pattern, produced by the friction sustained by the skin margins in contact with the missile, enables a physician to identify which hole is the exit and which is the entrance in a through-and-through gunshot wound. The outer skin edges of an exit wound do not come in contact with the missile and therefore do not sustain friction damage and do not exhibit this rim of abrasion. However, if a person is wearing tight clothing or the skin is resting against a hard, firm surface when the missile exits, the skin around the exit wound may be abraded from contact with this material. This produces a pattern called a shored exit wound (Fig 2,5.7.-12). FIG. 257-12. Characteristic "shored exit wound," an abrasion pattern resulting from missile exit when skin is resting against a hard surface. The presence of gunpowder residue surrounding a gunshot wound of the skin is a critical finding that needs to be described and documented with photographs before cleansing. The description of the distribution of the gunpowder residue, whether it consists of black smudging (soot) or stippling by particles of gunpowder, should include measurements with photographs. Wound photographs should always have a measurement scale in the field ( Fig. 257-2). Clothing soiled with gunpowder residue must be protected and retained for collection by law-enforcement agencies for analysis in the crime lab. This type of evidence is used for determining the distance between the muzzle of the weapon firing the bullet and the injured party. Establishing this distance provides one parameter for evaluating the validity of accounts given by each of the parties as to the circumstances of the shooting. For example, one person may allege that there was a struggle and the gun was fired in self-defense, while the other person may say he or she was shot without threatening the shooter in any way. Identification of the site of the entrance and exit of a gunshot wound path is an important step in the reconstruction of the shooting incident. When these incidents are not fatal, legal action often results, leading to a dispute over the accuracy of accounts given by each of the two parties: the injured party and the shooter. Physicians without forensic training should avoid giving any opinion regarding a wound being an entrance or exit, or whether it was caused by firing at close range or a distance, or whether any type of activity or movement occurred during the shooting or what type of ammunition was used. Rather, physicians should document in as much detail as possible the information set out above for evaluation by those expert in this area.